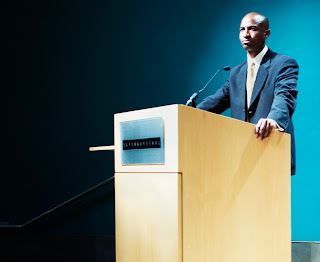 Nick R. Thomas adds his two cents to the "great lectern debate," as he has christened the recent discussions on public speaking blogs. "...whatever your height, you must be bigger than the lectern: in other words, be lively and animated in your delivery and don't bury your face in your written materials..."
Using a lectern: Do or don't? Oh my! What a large collection of words about such a trivial topic! I think that we all fall into one of two groups: those who like a lectern and those who don't. If you are wearing a mic, then it really doesn't matter - go where you want to go, stay if you must. However, as Nick mentions, if the mic is built into the lectern, then you are pretty much fixed in place. I view this as being similar to a professional sports team playing an "away" game - the conditions are not ideal, but you've still got a job to do. I try to make the most of the situation and when I'm tied to a lectern I focus on using BIG hand gestures and lots of eye contact to make up for the loss of full body language. Every presentation is a learning experience. It's not about whether a speaker likes or dislikes the lectern; it's about what benefits the audience most. And most of the time, speaking from behind a lectern doesn't benefit the audience, unless the speaker is larger than life (and larger than the lectern, as Nick suggested). Much of the time, the speaker has a say in the room setup. So why not request a setup that doesn't stick you behind a lectern? I do it all the time. I don't think any topic is trivial if it can help someone become a more effective speaker.